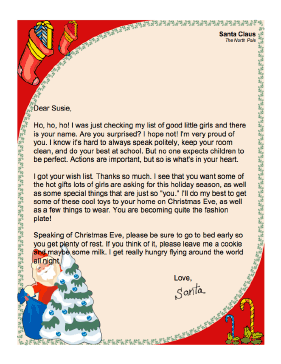 This printable letter from Santa Claus to a little girl thanks her for her letter and Santa promises to do his best to grant the girl's Christmas gift wishes. Ho, ho, ho! I was just checking my list of good little girls and there is your name. Are you surprised? I hope not! I'm very proud of you. I know it's hard to always speak politely, keep your room clean, and do your best at school. But no one expects children to be perfect. Actions are important, but so is what's in your heart. I got your wish list. Thanks so much. I see that you want some of the hot gifts lots of girls are asking for this holiday season, as well as some special things that are just so "you." I'll do my best to get some of these cool toys to your home on Christmas Eve, as well as a few things to wear. You are becoming quite the fashion plate!